Keep whales close to your heart with this beautiful whale pendant! It's no coincidence that Valentine's Day and World Whale Day fall in the same week. Because right now, these majestic creatures need our love more than ever before. Make a gift in support of our campaign to protect critically endangered whales, and we’ll send a special someone (or you!) 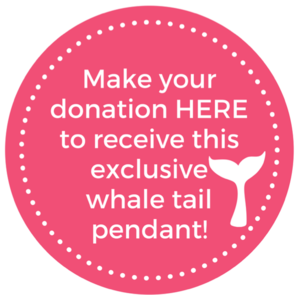 this one-of-a-kind whale tail pendant, designed just for Sierra Club supporters. Right now, our whales are under increasing threats – from mortal strip strikes, deadly entanglements in fishing gear and unsafe waters due to exploration. And in just the last 2 weeks, the shocking news that our own government has just given swift approval to BP to drill up to seven new wells this spring in whale habitat has added yet another layer of immediate danger. Help fight back to protect them with fierce love and a commitment to protect these magnificent whales. From the most critically endangered right whales and blue whales, to the iconic humpbacks who call our Canadian shores home – show your love for whales today so we can fight our bravest fight to save them. With loving thanks from the Sierra Club Canada Foundation team.